Beat the Truth In Housing Inspector Before He Shows Up | Your best resource for buying, selling, owning and investing in duplexes and duplex homes. If you’re thinking of selling your Minneapolis or St. Paul duplex, you’ll be required to have what’s known as a Truth In Sale of Housing report before the property goes on the market. This report is not the same as a buyer’s inspection. This is a city required inspection the seller is required to pay for which simply measures the property against current building code and requires that certain minimum standards be met to ensure consistency in the community’s housing stock. The most common items labeled as “Required Repairs” by city licensed inspectors seem to be items like making smoke detectors operable, installing carbon monoxide detectors and back flow prevention device. What’s a back flow prevention device? 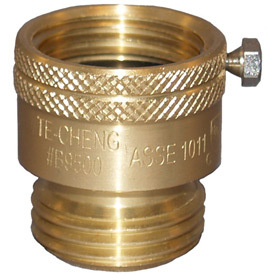 It’s a brass fitting that attaches to any faucet you normally would attach a hose to – whether it be outside the house or in your laundry room. So what’s it for and why is it important? If there would suddenly be a drop in water pressure as a result of high demand, a burst pipe or frozen pipes, the drop in pressure could result in unclean water being sucked back in to the city’s water supply. This simple little brass fitting keeps that from happening. To put them on before the inspector tells you that you must, simply run to your nearest hardware store. They’re a few dollars each – which isn’t much compared to the fee the inspector may charge to come back and see that you installed them after he told you to.